Crossings are short in duration with many under an hour. On the brief journey you’ll navigate through some of the most idyllic scenery in Thailand. 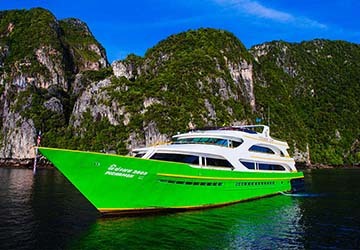 Chaokoh Ferry offers an affordable and enjoyable choice when it comes to discovering the famous golden sands and beautiful jungle landscape of the Phi Phi Islands. The Chaokoh fleet ranges in size and speed. 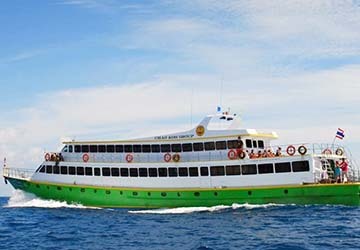 The Pichamon 2009 is the largest vessel in the fleet with a maximum capacity of 550 people in each voyage. The Pichamon 2 is the fastest of the three, reaching speeds of up to 15 knots. The final ship of the fleet, the Pichamon 3, can move at 13 knots whilst holding up to 360 passengers. With directferries.co.uk you can find Chaokoh Ferry timetables, fares and book Chaokoh Ferry ferry tickets. Where applicable we’ll also compare Chaokoh Ferry with alternative ferry companies.